I love when the famous people fight back on twitter. I loved it when Chipper Jones gave it back to a Mets fan on twitter which I blogged about a couple of years ago. There seems to be this belief that you can tweet anything you want to a famous person without consequences. That Mets fan was so hurt about what Chipper tweeted back along with what all the Chipper Jones fans had to say to him via twitter that he went crying calling Chipper a bully. Always funny because usually the person who starts the insults is the bully, the person responding is defending themselves. Curt Schilling gets his fair share of twitter hate and he accepts it, hell, most of it is from clueless Yankee fans, he should revel in it, "Yo, the bloody sock was fake". Pure geniuses! However, this time it is different. Curt Schilling tweeted out the news that his daughter would be going to college to play softball. It was a "Proud Papa" tweet. What he got in response was horrific. Basically, a couple of morons decided to talk about his teenage daughter and the things they would like to do to her sexually speaking, and I am being kind. Schilling responded in a way he hoped would give these two twitter warriors a chance to reflect and maybe apologize. However, when you are this stupid in life, the reflection gene usually isn't one that can be found real easily. What Schilling did next was brilliant. He exposed them! Some of the tweets were so bad they were criminal. Schilling explained in a tweet that years ago he would have drove to their house and taken action but this time he sat back and devised a plan. WEEI reported today that one of the other tweeters who chimed in was a New York Yankee employee, if true, he won't be employed much longer. I love to see justice being done. Also, follow on Curt's twitter timeline to see the idiots coming out saying Curt was wrong for what he did. These are the anti-consequences people. Lastly, congratulations are in order for Gabby Schilling. That was really the intent of all of this. Yes, she has had morons tweeting her nasty stuff as well. The key is to retweet them, screenshot them and get as much info you can about them. Looking forward to seeing more of the dominos drop. 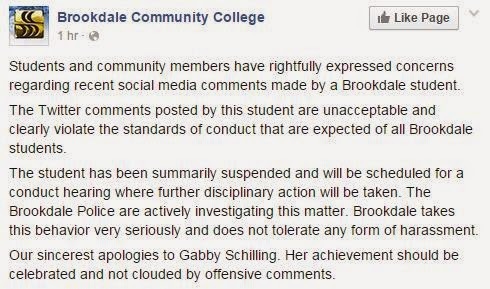 Brookdale Community College was the first, great job by them. More news to come. Great job Curt!.....and oh yeah...thanks again for 2004! How Believable is David Ortiz? Is Shane Victorino on the Trade Block?